My wife and I have raised chickens for years and have never successfully had one of our hens hatch her own chicks. As of today we have 6 little peepers running around. There are still several eggs she is sitting on, so we are hoping to get a few more within a day or so. 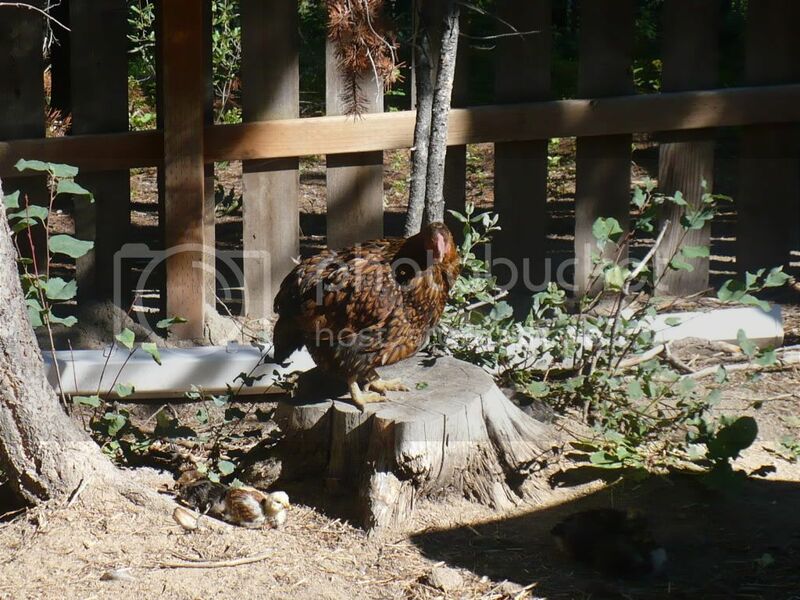 She is a golden laced Wyandotte as well as the 'father'. A couple of the chicks are from some of our slow growing Cornish that we haven't butchered yet. I've always wanted to see what a Wyandotte/Cornish cross would look like. Needless to say, we are very excited to see these little fellows running around while 'ol mother hen' watches over them all! Aww... pix please! 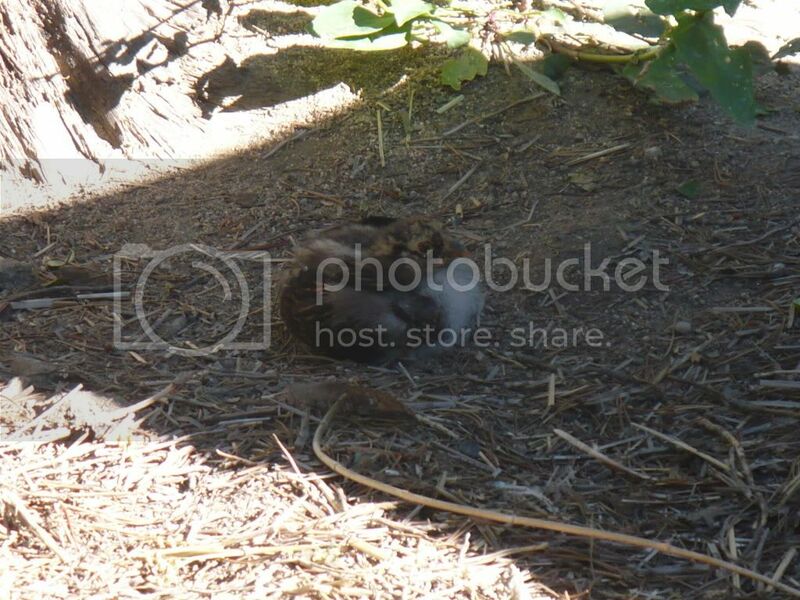 I miss having lil baby birds around the yard here. The only place we could have the incubators was in our bedroom... so listening to them peep for a day and then hatch was fun. A bit of a sad story to relate, but only to give ya a possible "heads-up". I hope ya do not have the same troubles with yours... Please take precautions. I will try to get pics when I can. When we get close to them she runs them back into their home. We have to 'spy' on them thur the window. They are a blast to have around, all those little "peeps". We got a dozen chicks a few weeks ago to replenish our flock of layers, and since we had a broody chicken we let her sit on one egg, so we have a little hybred chick as well. 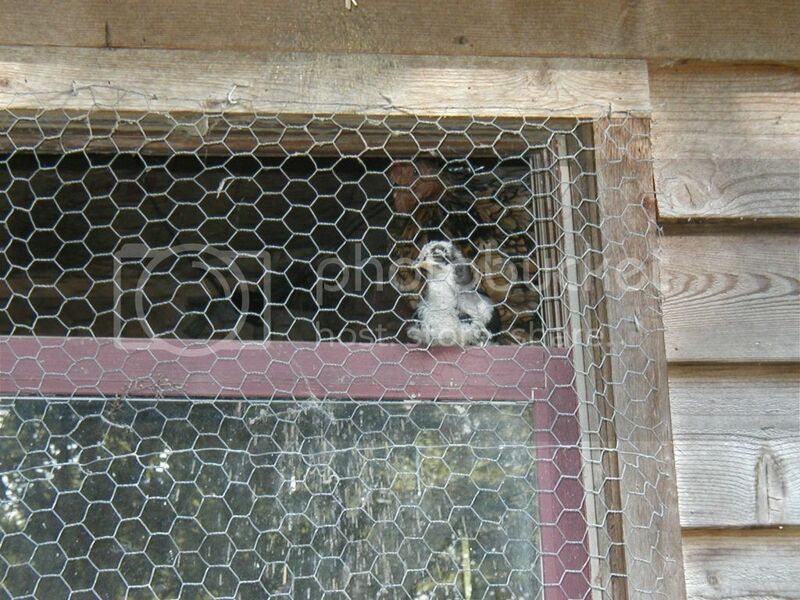 I've been keeping them locked up at night since we lost a few to predators, probably a racoon, maybe a fox. Our neighbors lost 19 chickens before he set out traps. Four trapped racoons, a possum and a new electric fence later they seem to have gotten the situation under control. Congrats!! They are sure cute when chicks. So I believe our final count is 7! Congratulations, "Dad"! We have a rooster coming in 2 weeks, so we'll try our hand at it...again. The last rooster we got was full grown, and had an attitude from the git-go. Besides, it was half the size of our hens, and they beat the crap out of him. His big mouth, big attitude and failure to launch paved his way to the stew pot. We did in several roosters this past winter that a friend gave us. Even being fully mature, that rooster we had would just about have fit in a 1 qt canning jar! Runt!!!! I tell ya OP, that home canned chicken was some of the best stuff I've ever had. We butcher all of our on chickens and cut some up and leave some for roasters. Anyway, we always save the carcasses and use them for stock and such. The last batch we did with the Roos and got all the meat off and canned that as well. Needless to say, It didn't last long. Now we need to do some more. Sounds like you and I run things the same way. We have another 2 dozen Cornish X's coming in about a month. Some will be butchered at around 2# live weight for bite-sized "game hens". The others get split up between fryers and canners. We tried an experiment this Spring with the first batch. We marinated wings and drumsticks in our "hotwings" marinade, and then cold-pack canned the seasoned meat. When my kid visits in a few weeks from back East, we're going to throw them in the basket on the rotisserie and see if they're edible. I'll get some pics up soon. She's letting us see them more now. As I said in the OP, we've had chickens for years and get new chicks every year, but to watch 'mother hen' with her little chicks is simply amazing! It is one of the simple pleasures of life that I have never experienced before. Been meaning to ask, are your chickens free range? Our big concern when our new rooster gets ready is how we're going to segregate "momma" from the other layers? 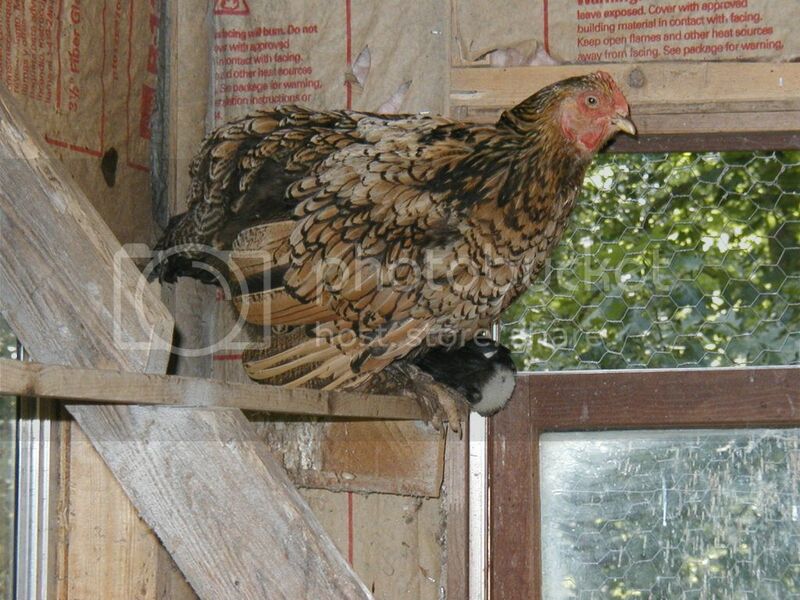 I'd hate to see her try to raise a clutch in a nesting box, or have the other hens wreck her nest out of habit. I'm in the same boat as you. I've had chickens off and on since the '70s, and steady for the past 16 years, but never raised any chicks during that time. I can use all the hints I can get. Yeah OP, our chickens are free range. We close them up at night though. We live up in the mountains so we have to watch out for critters. 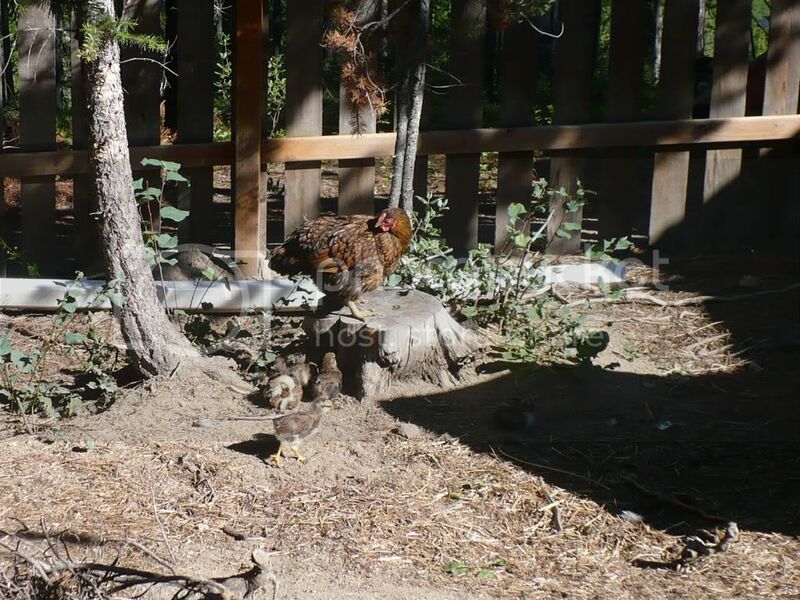 As far as the broody hen, we segregated her from the rest of the flock. She went broody in the wood shed, so after a week or so and we realized that she was serious, we moved her and the eggs in our little fenced in area in the back (it's where we raised a hog a couple years ago). We built her a little 'house' and put some straw in there and provided good shade and just left her alone. We would check on her every few days to make sure that she had food and water. Other than that we didn't bother her whatsoever. It seem to have really help that she couldn't be bothered by the other chickens. I really think that was the key to our (her) success. 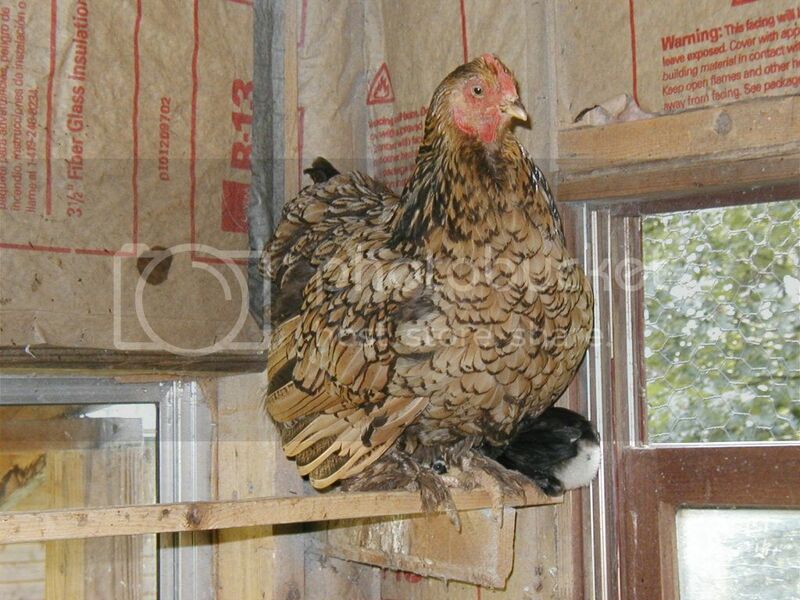 I have one hen who would rather sleep on a mess of eggs in the nesting box than on her roost. I'm going to have a heck of a time figuring out when one "goes broody" on me. Right now 8 layers share 3 nest boxes. And I mean share! The eggs are all mixed up. 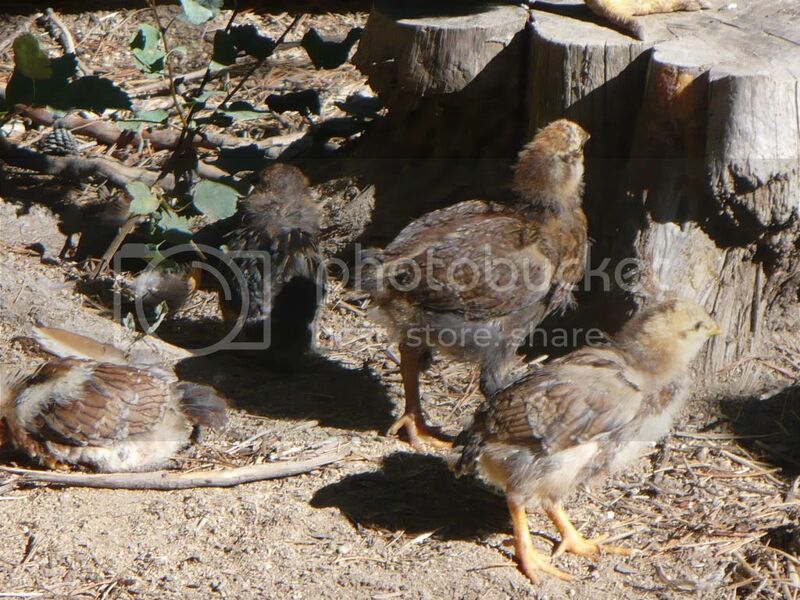 And I have 6 more pullets that are going to start laying in about 6 weeks. AND....I already have 16 dozen eggs in the 'fridge. Guess it's time to start dehydrating some more. When they get really serious they only get off the nest to drink, eat a little and poop. They don't stay off long. 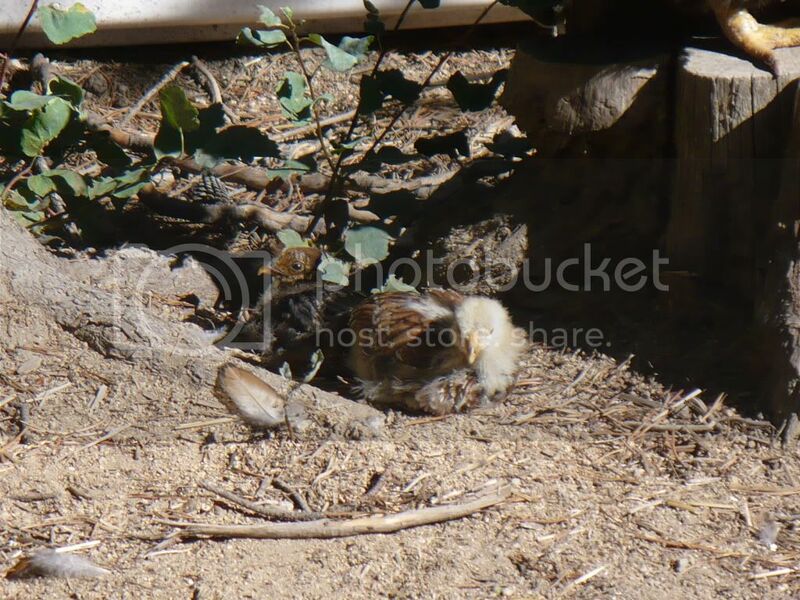 They also will cluck and 'strut' around fluffed out when they are off the nest. Since this thread is sorely lacking in chick pics, I decided to put up a few. My wife bought eight chicks which are now 12-14 weeks old, but one of my chickens got broody and ended up hatching one herself just a few weeks ago. Cute! So how many eggs was she sitting on to just get one to hatch? Just one. My girl knows how to incubate . 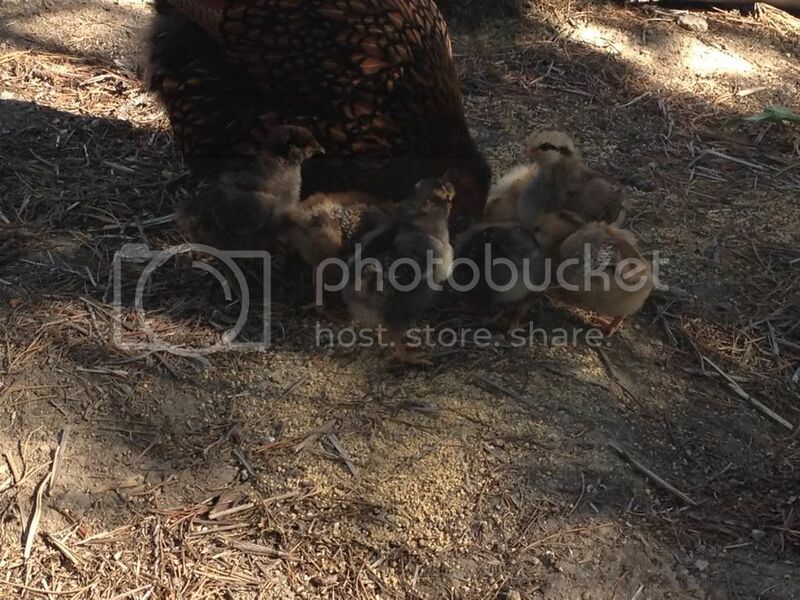 She's also a great mama, that little chick is doing fine with no interference from us. And my older chicks are just now starting to go back inside the coop to roost at night without persuasion, so instead of rustling chicks every night, I can just close the coop when they are all inside. Usually close to or just after sunset. The last pullets I raised to join the flock were over 4 months old before the older hens stopped making them sleep on the floor, instead of the roost. 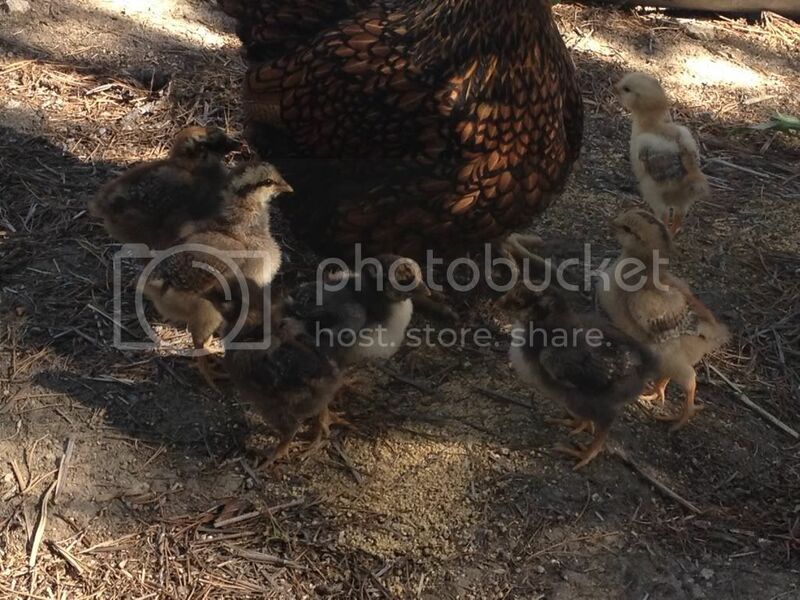 My flock was down to five hens and a rooster before I added these chicks. 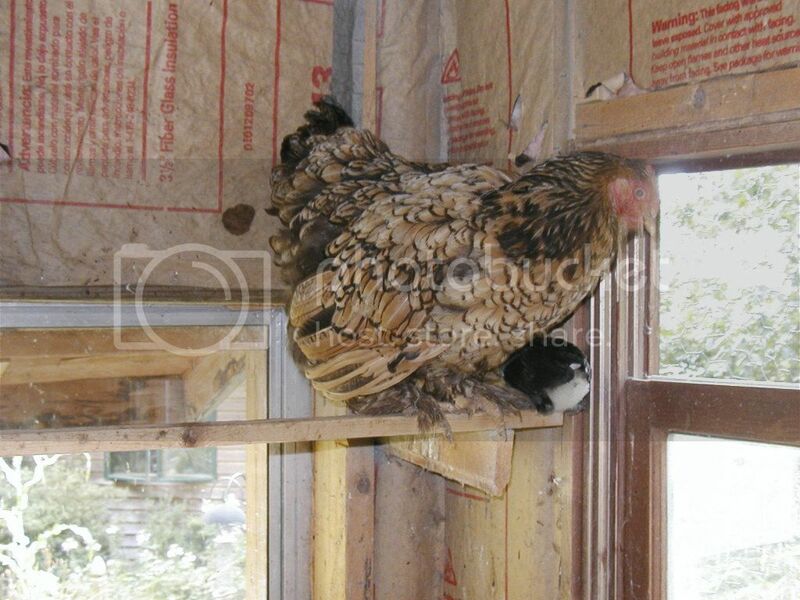 I think the low number of adults and a roomy multi-level roost helps keep things civil in the hen house. omg so cute!!! Thank you for posting pics.